The Hawaii live cam lets you enjoy the feast for the eyes that Hawaii is. The United States stat of Hawaii is made up of 8 individual islands. It is in the Pacific Ocean and is a volcanic archipelago that features lush landscapes, black sand beaches, crystal clear turquoise water is considered the perfect example of what paradise looks like. It is one of the most isolated, populated places on earth. It sits over 2300 miles from the American Mainland, 3800 miles from Japan and over 5000 miles from the Philippines. It supplies the world with 2/3rd of the pineapples. It is home to more than 100 beaches that are considered some of the most beautiful in the world. Each island has their own claim to fame. Some are considered the best surfing places in the world. While all the islands are among some of the most beautiful places in the world, Molokai is considered the “Most Hawaiian” because of its commitment to keeping things as natural as possible. The population is an interesting makeup of a range of minorities. There is no majority population in Hawaii. Everyone is either from somewhere else or a mixture of native and other nationalities. Honolulu is the largest city in Hawaii and technically has the largest land mass of any other city in the world. 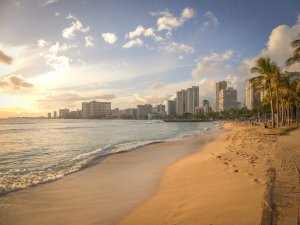 Every area in Hawaii that is not claimed by other counties, is considered part of Honolulu! Population: Approximately 1.4 million people call Hawaii home. Main Attractions: The world-famous Waikiki Beach, Pearl Harbor, Volcanoes National Park, the Kona historic coffee farm and so much more!